The Xiaomi Mi Max 3 is more of a tablet than a phone. It is probably the biggest phone of the year, with a clear 6.9 inch IPS display; it resembles the mini-tablets that were making rounds in the market not too long ago. With Xiaomi, one can always expect a low price tag and top-notch features. 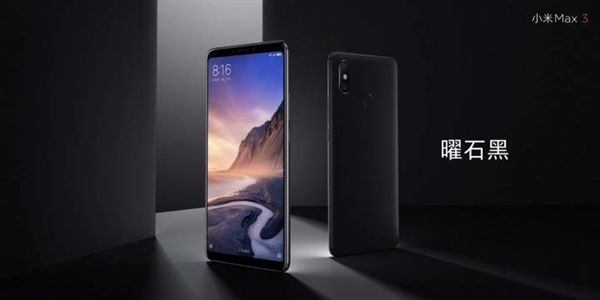 The outward appearance of the Xiaomi Mi Max 3 is fairly simple; it has rounded corners, small side bezels, no notch, a small chin and the 18:9 screen to body ration that helps to manage the phone in one’s hands. Despite this, the Xiaomi Mi Max 3 is not at all a phone that can be operated by one hand. The position of the fingerprint scanner is such that you will need two hands to rightly hold and place the finger on the scanner to unlock the phone. The Xiaomi Mi Max 3 has a slippery aluminum back, which might mean that the phone will slip out of your hands more than usual due to its big size. Xiaomi has made sure that the Mi Max 3 has a solid inside build- no compromises on the hardware. The Xiaomi Mi Max 3 has a Snapdragon 636 chipset coupled with 4GB RAM or 6GB RAM. The phone will come in two variants with a choice of different RAM power and internal memory-32/64GB. The phone has a dual sim slot, however, if you choose to opt for expanding your memory by inserting a microSD card then this will prevent you from using the second SIM slot. The Mi Max 3 does not come with an extra microSD card slot and thus the users will have to insert it in place of the second SIM. Strange as this is since the phone is huge in size, but for now users will have to make do with this hybrid SD card/SIM slot. On the rear side of the phone is its dual camera, with a 12MP primary camera and f/1.9 aperture and a secondary camera of 5MP particularly installed for depth-sensing. The selfie camera is 8MP with a f/2.0 aperture. Even though the Xiaomi Mi Max 3 is not high priced it still has all the latest artificial intelligence (AI) properties such as beauty mode, screen recognition and face unlock. Xiaomi was smart enough to pack the Mi Max 3 with a huge battery that wouldn’t drain in a few hours as it has to support a demanding phone. The Xiaomi Mi Max 3 has a 5,500 mAh battery which is supported by fast charging. It comes with an 18W QC3 charger. The phone runs on Android 8.1 straight out of the box along with Xiaomi’s own software the MIUI 9. However, the company has affirmed that it will update the Mi Max 3 to MIUI 10 soon. If you’ve been looking for a big phone, the Xiaomi Mi Max 3 should definitely be a part of your consideration list.